Get your complimentary copy now! To select the best grounding method for shielding cable installations, you have to strike a balance between installed cost and grounding performance. Yet, that's easier said than done. Some of the most common grounding methods, while seemingly inexpensive in terms of the component cost, require labor-intensive installation procedures that can drive up installed cost significantly. Other methods lack the full 360 degree contact. 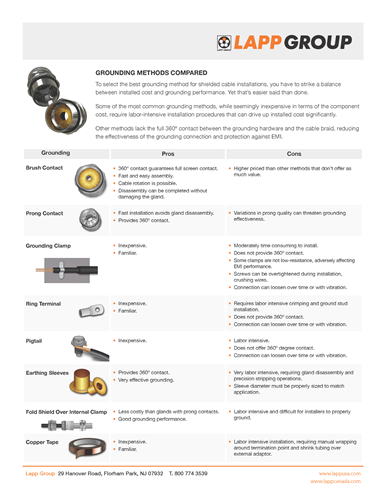 Download our quick reference guide to help you quickly select the most reliable and cost-saving grounding method.